Miami is a city that we’re always excited to visit… But our most recent visit there was a special one as we planned to bring together both Chris’s parents and my parents for a cruise to the Bahamas. Not only would this be Axel’s first time having all of his grandparents together in one place — but it would also be the first time we ever traveled with our families. As the cruise we booked was set to leave from Miami we decided it would be fun for everyone to spend a few days in the city before we set off for the Bahamas. 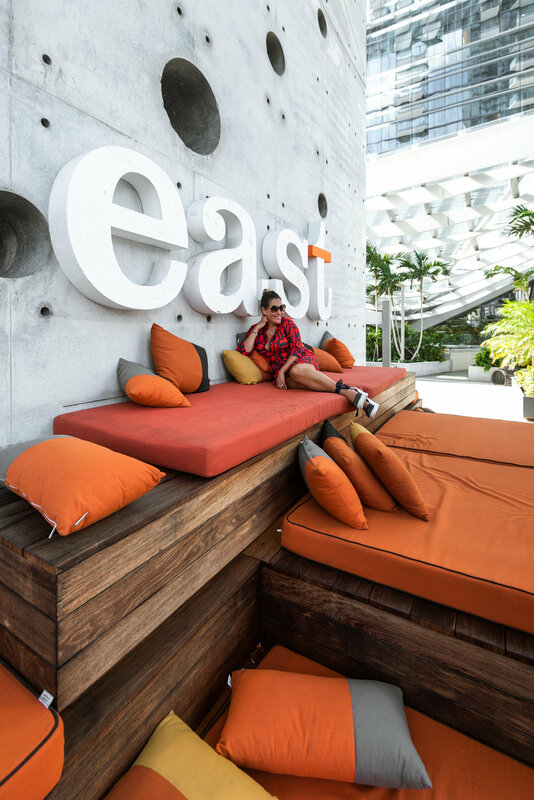 As we started planning our trip to Miami, we knew immediately we wanted to stay at EAST Miami because we had already stayed there once before. We had also stayed at the EAST Hotel in Beijing so we were familiar with the brand, and knew that they’d provide a casual yet luxury atmosphere that would be great for a family getaway. The hotel flaunts a sleek and contemporary style, while remaining super comfortable and inviting. Plush couches line the walls of the apartments and invite you to get cozy. Pieces of Miami's culture are woven throughout the rooms. Post-contemporary, abstract and nature-inspired artwork adorns the walls in coordinating color schemes, nodding to the city's distinguished galleries and visual art scene. 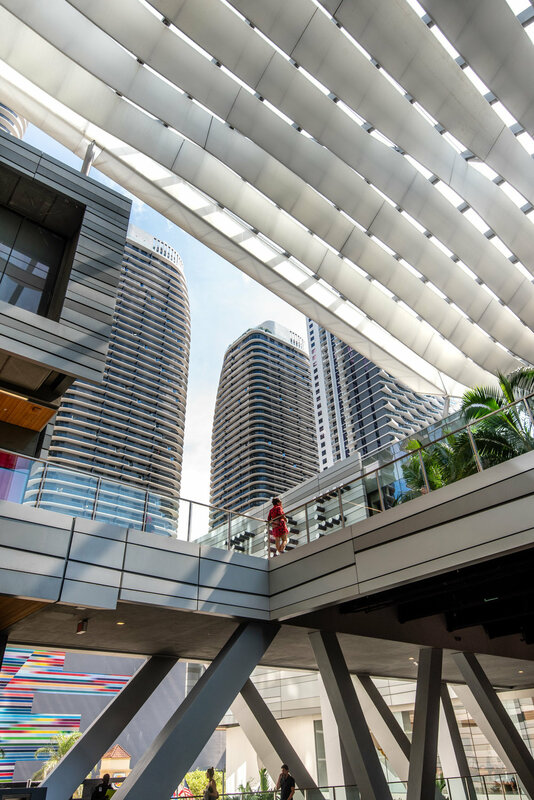 EAST Miami hired the acclaimed architecture firm Arquitectonica to design the hotel, whose architects took inspiration from Feng Shui and bio-geometric schools of design in conceiving it. EAST Miami didn't leave just the building to the experts. Cloudagh Design of New York planned out the interior. The hotel's owners think about the execution of each detail, from the glass prism exterior to each of the colorful couch cushions, no stone has been left unturned. The layout of the lobby and each of the rooms is thoughtful and immediately lends a welcoming feel. Because we wanted to have the family all together, we opted to stay in one of the three-bed, three bath, private residences at the EAST Miami. This apartment afforded us privacy, the ability for us to stay together with our parents while having our own spaces — plus it offered some comforts of home, like a washer and dryer :) And having a fully equipped kitchen enabled us to prepare healthy home cooked meals in our apartment, and even sit down for family dinner. But the highlight of our apartment was the view of downtown Miami, in every direction we looked our view was framed with skyscrapers and the bay. 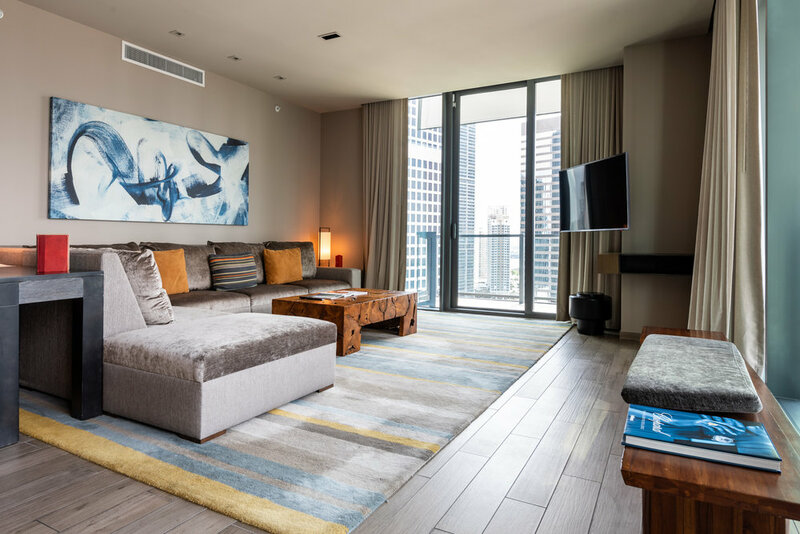 But, what I love about this hotel is that there are seemingly no bad rooms, whether you stay in a standard room, a suite, or a private residence, you will have simple but exceptional luxuries: floor-to-ceiling windows, a view of the Miami skyline and Biscayne Bay, and elegant, modern furniture. It is pretty hard to find a hotel that guarantees you a breathtaking view regardless of the room. In addition to a host of different room options, EAST Miami knows how to take advantage of Florida’s gorgeous climate. It has a spectacular, 20,000-square-foot outdoor pool and deck on the 5th floor that will excite any swimmer or sunbather. They have a lap pool and hot tub, and even a spot for a cold plunge! Bright and comfortable chaise lounges and tents line the deck, and it is ideal for relaxing in the sun. They also have several venues for hosting events in indoor and outdoor spaces, including one, called The Shrubbery, on a suspended deck and under a place called the Climate Ribbon, with perfect Miami sun. During our first visit to Miami several years ago we fell in love with Sugar, EAST Miami's rooftop bar. This time we wanted to return and bring our parents along so they could experience the panoramic views from the 40th floor. The bar's menu has an Asian influence honoring the company's Asian roots which is a welcome change from other bars downtown. Sugar offers classic and more unique sushi rolls and Asian appetizers, but they also have gourmet cocktails that are delicious! It was so cute to see our parents navigate the extensive drink menu and to watch them order craft cocktails! The menu has drinks with exotic ingredients such as the Tiger Lily; with rum, hibiscus, passion fruit, ginger beer and lime juice, as well as the Lychee Blossom; containing rum, sake and lychee. Sugar is perfect for meeting up with friends and having a fun night out (and for trying some new drinks)! Quinto la Huella is EAST Miami's only restaurant, and it is actually the first outpost of Uruguay's Parador La Huella, a beachfront restaurant. The restaurant has a relaxing atmosphere and simple dishes. Executive chef Nano Crespo has been formally trained in Argentinian and Italian cooking techniques and cuisine and studied farm-to-table eating in California. His diverse culinary background inspires dishes that incorporate different cultures. While dishes like Atún Crudo, with tuna, avocado, mint, lime and taro chips speak to his Latin American cooking experience, Spaghetti con Langosta, with house-made chitarra pasta and Maine lobster speak to his Italian training. Definitely do not miss Sugar or Quinto la Huella! However, if you’d like to get out of the hotel and experience some local food, EAST Miami is located near some of the Miami’s best food neighborhoods — including Little Havana. We asked our followers for suggestions on where to eat in Miami and we received many recommendations for Versailles Restaurant — which after having eaten there twice in 4 days we can say we highly recommend it! It has delicious, authentic Cuban food and it's a great way to experience Miami's culinary scene. Overall, this was the perfect place to visit with our family. It was wonderful to find a place where we could all be together and have our own space at the same time. EAST Miami more than accommodated all of our family's needs. We can't recommend this hotel enough.